Watch your ticket sales soar as fast as a car doing qualifying runs Get the word out about your gathering with the Stock Car Flyer! Decorated with the image of a checkered flag and stock car and with room for up to six custom images, this flyer is a wonderful way to promote your next stock car or NASCAR gathering! 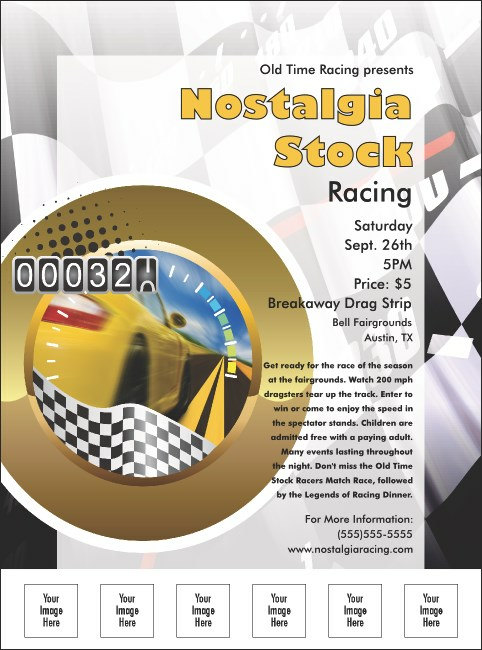 Get them to race to the raceway with tons of great designs from TicketPrinting.com.